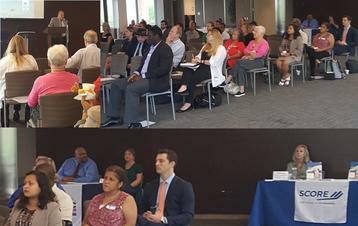 The Vista - SBA Day and Lender Fair event, was coordinated by SBA San Diego's Lead Lender Relations Specialist Maria Hughes and Acting Lead Economic Development Specialist Mike Sovacool and hosted by the Vista Chamber of Commerce. The event was conducted on Wednesday, July 26th, at the Vista Civic Center. There were more than 60 participants at the event, which consisted of speakers from the IRS and USCIS, as well as, an attorney and an insurance agent. The presentations were followed by a lender fair at which attendees were able to meet with local lenders, and SBA resource partners, and network with other attendees. Photo above: (L to R) SBA San Diego's Economic Development Specialist (EDS) Levi Kinnard, Lead Business Opportunity Specialist (BOS) Carlos Liu, and Lead Lender Relations Specialist Maria Hughes; SBA's Deputy Chief of Staff Eric Jones, SBA San Diego's EDS/Public Information Officer Cynthia Harris, Acting Lead EDS Mike Sovacool and Deputy District Director Jill Andrews. The SBA San Diego District Office had the pleasure of hosting Eric Jones, SBA’s Deputy Chief of Staff for three days, July 26th - 28th. During his visit to San Diego, Eric provided opening remarks at the Vista - SBA Day and Lender Fair event. Eric also took time to meet with district staff to get to know them and learn a little about how each staff member contributes to the SDDO team to meet goals and assist the small business community. 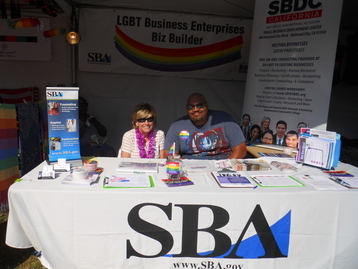 Photo above: Maria Hughes, SBA Lead Lender Relations Specialist and Marquise Jackson, Director, SBDC San Diego and Imperial Network, at the San Diego Pride Festival promoting the LGBT business certification and SBA/SBDC services. The festival was a two day event attended by more than 50,000 people. Program Coordinator for the LGBTBE Biz Builder Program. 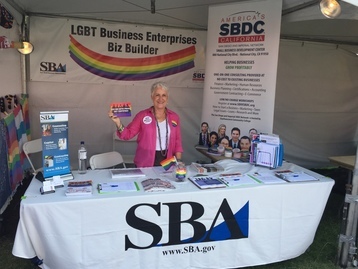 The SBDC Network, under the direction of Michelle Burkhart, created an LGBT certification program to help certified companies get Diversity Supplier contracts. Most large companies offer contracting opportunities for the LGBT. Additional funding for the program was provided by OSBDC based on recommendations from Eugene Cornelius who was instrumental in starting the program in San Diego the previous year. Another session of Export University successfully completed! Photo above: Martin Selander, SBA International Trade Specialist presents on "SBA International Trade Finance Programs," at the fifth Export University workshop. Victor Castillo, Director, San Diego CITD provided opening remarks and an overview of programs available through the CITD. Debbie Gelbach, First Vice President, Banner Bank, provided "International Payment Options"
Sandra Donzella, Deputy Managing Director, Export-Import Bank of the U.S. - Western Region presented on "Export Credit Solutions for Export Success!" Maria Hughes, SBA Lead Lender Relations Specialist, San Diego provided an overview of SBA's programs and services. Martin Selander, SBA International Trade Specialist, U.S. Export Assistance Center, Irvine, CA spoke on "SBA International Trade Finance Programs,"
This workshop was conducted on July 19th, at Point Loma Nazarene University's Mission Valley Campus. Photo above: John Walker, Co-founder and Chief Solutions Officer for Talent Evolution, presents Email Marketing workshop, to 37 attendees, at an event hosted by The Microsoft Store - Fashion Valley, on July 26th. Photo-Left: Fred Schlaffer, SCORE Counselor, provided an overview of SCORE's counseling and training programs for small businesses and worked an exhibit table at the Email Marketing event. Photo-Right: Lynn Pittman, Consultant, San Diego and Imperial SBDC Network, provided an introduction for the SD/IV SBDC Network and the SOCAL VBOC and worked an exhibit table at the Email Marketing event. Supporting female startups in the SoCal innovation ecosystem is an actionable plan on closing the gender gap in startup funding. If you are a founder or investor, applying, attending and supporting events by accelerators and cowering spaces are key in growing the startup culture. The Hera family of collaboration and connectivity through a business accelerator, cowering space and angel investing group has four fabulous events to attend in August and September. 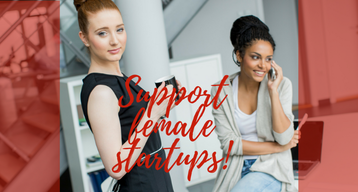 Support female startups in Aug & Sept by applying to, RSVPing to, getting your tickets for either (or ALL) of our Hera family events: Demo / Grad Day, Hera Fast Pitch, Red Flags & Red Wine female angel pre-summit event, and our signature Hera Venture Summit. Get connected and networked in meaningful ways for efficient support of your startup or investment activities. During this last session of Export University, participants will have the opportunity to discuss their export plan with a panel of trade professionals. Photo above: 125.5 lbs. of non-perishable food items have thus far been donated by SBA San Diego District Office staff members. Additional donations are anticipated during the month of August. Join us in supporting feds feed families now through August 31, 2017. Last year, SBA raised over 121,000 pounds of food nationally. This year we plan to beat that number and achieve our goal of collecting 122,000 lbs.! Bringing non-perishable food items and placing them into the designated collection box in the SBA San Diego District Office lobby, at 550 West C Street, Suite 550, San Diego, CA 92101. Donating your surplus to your local food bank, if you are a gardener. Visit this link to learn more about this opportunity: www.ampleharvest.org. Volunteering to harvest non-marketable produce through a process called “gleaning”. Visit: http://www.sdfsa.org/gleaning/ to learn about possible gleaning opportunities in the San Diego area. Make financial donation to Feeding San Diego - https://feedingsandiego.org/, The Jacobs & Cushman San Diego Food Bank - http://sandiegofoodbank.org/, or the food bank of your choice. Contact Cynthia Harris, 619-727-4884, for additional information on coordinating a donation, a drop-off, or reporting a donation made on behalf of the SBA San Diego feds feed family campaign.